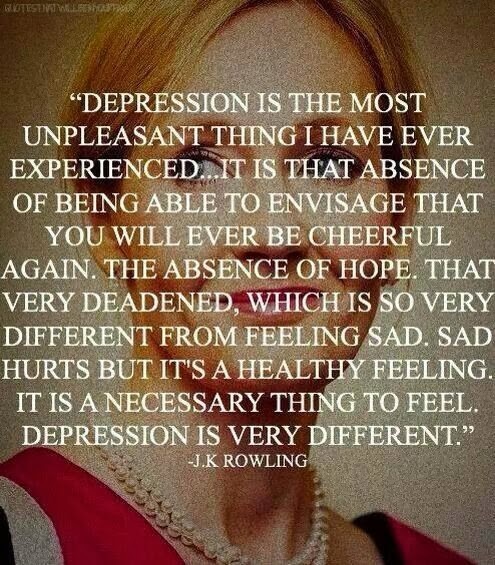 “Depression comes as a gift that stops one from hurrying briskly, confidently into the market. Stops one from rushing to the shopping center to buy one more bargain blouse for an already overcrowded closet. Stops one from emptily mouthing what one no longer believes in anyway. “Depression stops time… and one settles into one’s own waters as a sailing vessel without wind… without wind… without momentum…and one sinks into one’s depths. “And somewhere, deep inside, in the beehive tomb, one sits alone… and weeps. “Depression serves a woman is it presses down on her, forcing her to leave behind that which was not herself, which had influenced her to live a life alien to her own nature. Her suffering, now substantial, insists that she no longer deny its truth. “Suffering is feared and the sufferer outcast. Collective attitudes have evolved fostering archetypal masculine doing and achievement values. As woman entered the work realm outside her home, there was little alternative but to adopt those values. There was little recognition that her processes as woman was of a different nature or that doing/achievement values were not complete or valid for her. “The issue is not whether woman can achieve, but that preoccupation with achievement may deny a descent into her deeper nature which a woman must make to touch her true strength. The masculine must perhaps fly to fulfill a part of its heroic nature. But woman, pressed to fly, may lose herself and be prevented from descending into her depths, prevented from fulfilling her own feminine nature. “A woman through her descent, touches a deeply feminine authority, as different from the authority of the masculine as is the moon from the sun. “It is an authority not of abstracted, rational, objective knowledge, but an authority which allows her to speak from her own unique experiencing of life, from her own deepest personal conviction. “A woman prevented by her own fears or cultural attitudes from making this descent, is left to speak only from her achievement-oriented side rather than from a deeper experiencing of herself as a woman. “…It is this meaning, emerged from her own suffering, that allows a woman to descent, each time anew, into her own depths, to be present to the truth and wisdom lying there. For only by her willing descent can she uncover, again and again, the meaning of her life.